Most of us have heard labels like innovator, early adopter, late adopter, or even laggard come up in day-to-day discussions on technology use. Your dad, for example, may seem like a perpetual laggard by refusing to update that stereo left over from his college years, or your Aunt Edna might be an early adopter because she was the first in the family to purchase a hybrid car. For most of us, it feels very natural to start separating ourselves, our families, and our colleagues into these kinds of boxes. Labels like these far from do justice to the complexity of technology adoption decisions. Technology integration is a fundamentally idiosyncratic and necessarily personal process, yet our language and vocabulary around technology adoption do little to affirm this reality. Much of our public perception on technology adopter types has been shaped by a seminal theory that emerged in the 1960s. Everett Rogers, who popularized some of the terminology mentioned above, first published his Diffusion of Innovations in 1962. If you’re an early adopter type, you can even grab an e-book version of it on Kindle! Rogers himself notes that these are standardized, “idealized” constructs of what are fundamentally very complex human decisions. And yet the language of “adopter types” is powerful enough to color our conversations to this day. With this tension in mind, I recently embarked on a master’s project focused on gaining new language and new respect for the vast array of approaches to educational technologies that higher ed instructors can take. The following presentation walks you through some of the research, and presents a framework for reflecting on your own technology identity and personal vision for applying technologies in your learning spaces. What type(s) of technology user are you? What primary traits do you show when considering technologies for use in your learning environments? 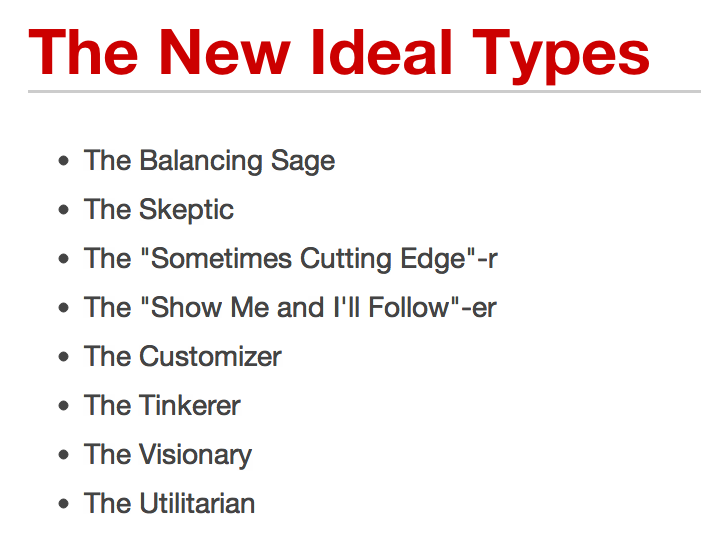 What secondary traits color your approach to technologies? Note: The presentation includes an audio narration, and is best viewed using Firefox or Chrome on a desktop or laptop. Above all, in viewing the presentation, I hope you have been able to challenge yourself to consider deeper aspects of your technology identity, to consider more than simply how much and how quickly you adopt technology tools in teaching, learning and life. Once you have reflected on your primary traits, start with the tips below to stimulate stronger conversations on educational technologies between you and the colleagues around you. While you may be somewhat skeptical of the expanding role of technologies in education, there are likely at least a handful of technologies that feel highly compatible with your values and lifestyle. What is it about these technologies that “works” for you? Consider collaborating with a Visionary to compare pedagogical values and visions. You may discover you have some important pragmatic insights to bring to the discussion on classroom technology. Challenge yourself to test out a technology you’ve never tried before. Start by asking a student to teach you to use a technology that is important to them. While you’re doing this, listen carefully to what they value about the technology. Consider how the technology is compatible with their lifestyle and worldview, and how it might enhance their ability to be an effective learner. How can you capitalize on this potential? Challenge yourself to think of relevant ways to reframe or integrate this technology into your teaching. As a “Sometimes Cutting Edge”-r, you likely have a handful of tech-related “toys” you’re exploring in your personal life. Challenge yourself to come up with pedagogical applications for one of these technologies, bring it into your teaching, and share it with your students. Team up with a “Show Me and I’ll Follow”-er and share some of the technologies you’re most excited about. Pair up with a Tinkerer or a “Sometimes Cutting Edge”-r and meet up regularly to discuss what technologies they’ve been exploring recently. Challenge each other to come up with teaching uses for these technologies, and support each other in testing them out in your classrooms and learning spaces. You have a strong sense of agency and individuality when determining which technologies are compatible with your needs and lifestyle. Make an effort to pass along this type of discernment to your students. Be vocal with your students about what technologies work for you and why, and be open about which technologies you choose to reject and explain your reasoning. For students who have grown up without deeply questioning their habits and preferences around technologies, you can model ways for them to take increased agency over their technology decisions. Seek out a “Show Me and I’ll Follow”-er and share one of the technologies you’ve been geeking out to lately. If your head is spinning with ideas, they can be a helpful sounding board as you hone your technology excitement into concrete teaching techniques and applications. Work with each other to test out these ideas in your respective learning environments. You may find yourself with plenty of exciting ideas of how you might want to incorporate technologies into your teaching, but not enough sense of the tools that are available or where to start. Seek out a Tinkerer, explain some of your wildest pedagogical visions, and see if they can’t support you in finding technologies to make these visions a reality. And when testing out new classroom technologies, team up with a Utilitarian for additional pragmatic insight into how to sustain new technology applications within your pedagogy so they don’t become simply a passing fad. You likely have a few favorite tools or technology processes that you’ve gotten to function well for you. Consider gathering a group of colleagues and sharing a quick demonstration of your workflow. Pair up with a Visionary, as they can help challenge you to think past the practical and into new realms of possibility. Oppenheimer, T. (2004). The Flickering Mind: Saving Education from the False Promise of Technology [Kindle edition]. New York: Random House. Rogers, E.M. (2003). Diffusion of Innovations, (5th ed.) [Kindle Edition]. New York: Free Press. Venkatesh, V., Morris, M., Davis, G. B., & Davis, F. D. (2003). User acceptance of information technology: Toward a unified view. MIS Quarterly, 27(3), 425–478.